If you like, you can order prints of above image at Shutterfly (8 x 10 size works best). protesting against the "Death of Evidence"
It used to bother me when people such as yourself that know absolutely squat about climate change (a subject in which I am an expert and forever striving to increase that expertise) make claims that are completely without scientific merit, in fact that are downright wrong, quite often intentionally wrong. Why? In most subjects this would not matter. Not so with climate change. Because our climate is collapsing around us and there are still many many people that fail to see this. So humanity will not act, and it will get worse and worse until there will not be a single person on the planet that does not experience gut-wrenching change. People are dying now, and will be dying in ever greater numbers from the near-term changes that are underway. Massive crop failure in the U.S. this year will not starve people in North America but will stress the economy and pocketbooks of many residents. It will starve people already in poverty who pay 25% or 50% of their incomes on food now. North Americans will not panic over one year of crop failure. However if it happens the following year, and the one after that, and after that then the system will snap. Climate denialism and such nonsense no longer bothers me because I have learned how to deal with such people and views. 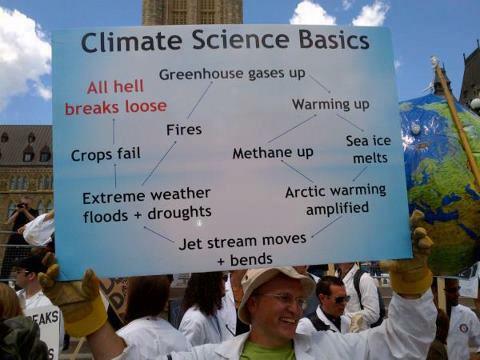 As is absolutely required for anyone in the field of climatology. How? I initially take the time to explain some science and educate but when it is clear that I am dealing with an immovable object like yourself or yyyyy I just have some fun with it and hurl a few insults, etc. However this gets old and distracting and unproductive very quickly and wastes a lot of time. As it has now, in your case. It no longer bothers me because our planet is now committed to this gut-wrenching change. The sea ice will be gone very soon and the roller coaster ride will be unstoppable. If I was Obama or Putin or any other world leader I would declare "War on Warming", cool the Arctic with geoengineering to keep the sea ice intact and the methane in the ground and undergo a crash program to slash emissions. But I am not. So I do what I can to educate people/inform them/get the word out. I join organizations like AMEG (Arctic Methane Emergency Group). I meet with politicians at all levels of government and talk about the urgency of climate change and necessity of rapidly cooling the Arctic. I have a clear conscience because I have tried. I know that many people around the world will die, I know that unbelievable changes are starting to occur and will explode in frequency, amplitude, spatial extent and impact over this decade, and I know that the general public will be in shock when their familiar climate system becomes a complete stranger to them...Personally, as I have acquired more and more knowledge over the course of my Ph.D. studies in abrupt climate change, I have passed through the shock stage, and the subsequent unaccepting stage of grief a long time ago, I am in the acceptance stage now. Apologies, it was a blast to hurl invective back and forth, but I am not playing that game anymore. I will not be reading ANY of your posts on this thread, for a while anyway. I need a XXXXX break. P.S. I did not take the time to write this post just for your sake alone. I am posting it, with your name removed, in social media under the heading "How to part ways with a climate denier that has incredible stamina . . .". Thanks for the learning experience. The January-June period was the warmest first half of any year on record for the contiguous United States, reports NOAA in its June 2012 overview. The national temperature of 52.9°F was 4.5°F (2.5°C) above average. 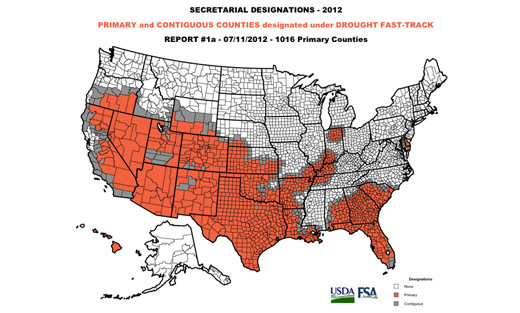 The United States Department of Agriculture has designated 1,016 primary counties in 26 states as natural disaster areas, making it the largest natural disaster in America ever. The U.S. Drought Monitor has declared 80% of the Contiguous U.S. to be abnormally dry or worse, with 61% experiencing drought conditions ranging from moderate to exceptional—the largest percentage in the 12-year history of the service. In the 18 primary corn-growing states, 30% of the crop is in poor or very poor condition. In addition, fully half of the nation’s pastures and ranges are in poor or very poor condition. The year-to-date acreage burned by wildfires has increased to 3.1 million. NOAA reports record temperatures in many places; in Mc Cook, Neb., it was 115°F (46°C) on June 26, while in Norton Dam, Kan., it was 118°F (48°C) on June 28. 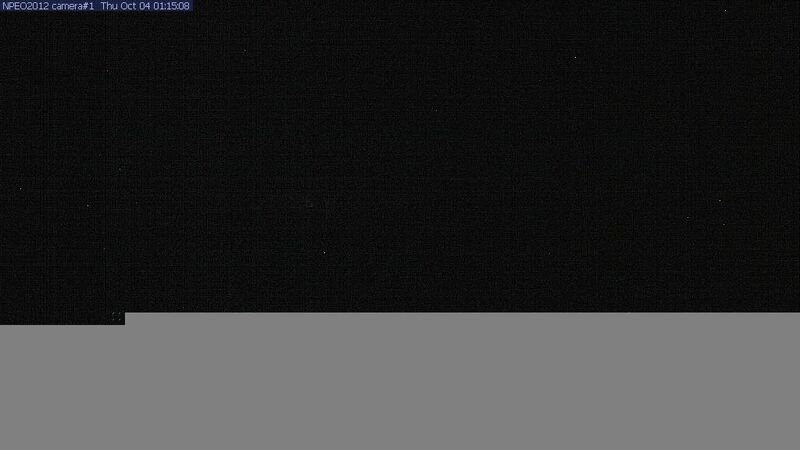 Meanwhile, it was 126°F (52°C) in Death Valley National Park on July 10, 2012. 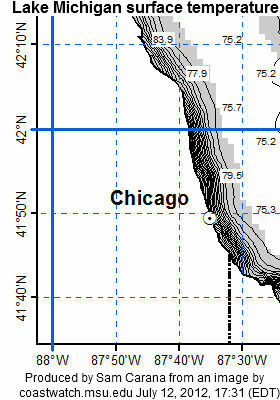 Lake Michigan surface water temperatures recently reached temperatures of up to 83.9°F (29°C), as shown on the image right. Lake Michigan has a surface area of 22,400 square miles (58,000 square kilometers). The lake's average depth is 279 ft (85 m), while its greatest depth is 923 ft (281 m). The image below compares 2012 surface water temperature with the average for 1992-2011. Earlier this year, in March 2012, another heatwave hit much the same area. A NOAA analysis of the heatwave notes the abrupt onset of the warmth at Minneapolis, Duluth, and International Falls on 10 March. On subsequent days, anomalies of well over 20°C (36°F) were recorded as shown on the image on the right. 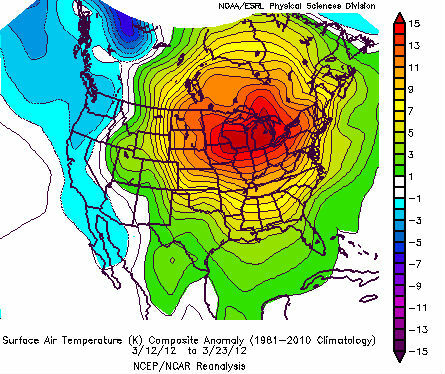 Temperature anomalies of 27+°F (15+°C) were recorded in a large area from March 12th to March 23rd, 2012, as shown below. Global warming is responsible for much of the frequency and intensity of extreme weather events and this is linked to developments in the Arctic, where accelerated warming is changing the jet stream, concludes an analysis by Rutgers University professor Jennifer Francis. Apart from the obvious impact that droughts and heatwaves have on food and fresh water supply, they also come with wildfires that cause additional emissions, constituting a further positive feedback that further contributes to global warming, while the additional soot makes things even worse in the Arctic. 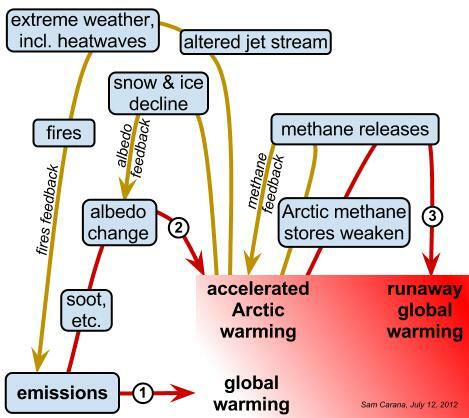 All this combines to create a situation in the Arctic where extreme local warming events can trigger methane releases, causing further local warming and further releases of methane, in a vicious cycle that threatens to escalate into runaway global warming that feeds on itself. Emissions by people cause global warming, with temperatures rising around the globe, including the Arctic. 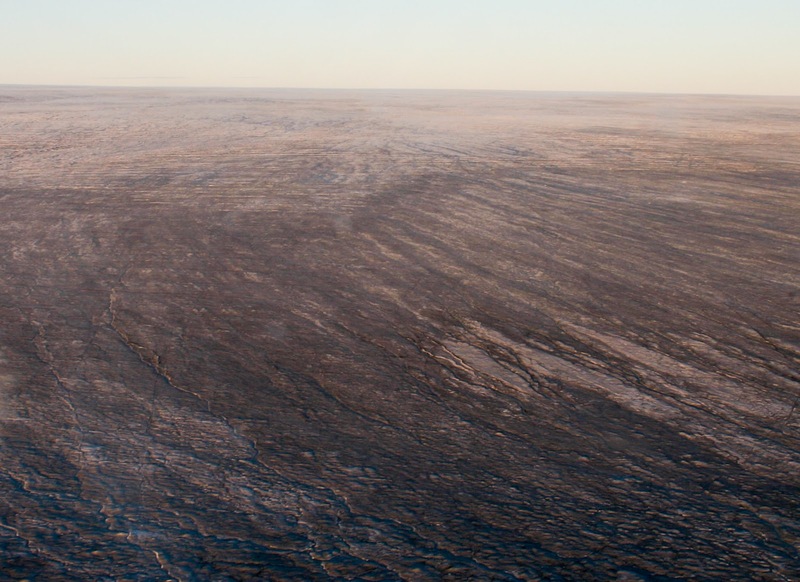 Soot, dust and volatile organic compounds settle down on snow and ice, causing albedo change. More heat is absorbed, rather than reflected as was previously the case. 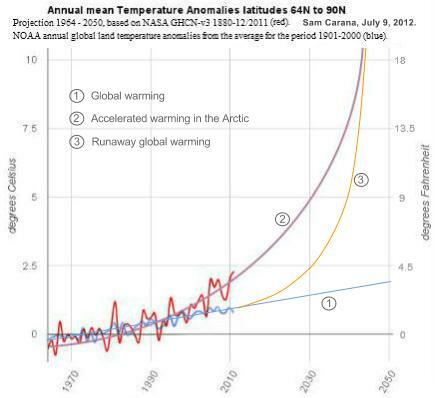 This causes accelerated warming in the Arctic. Accelerated warming in the Arctic threatens to weaken methane stores in the Arctic with the danger that releases will cause runaway global warming. Rapid warming periods in the past constitute an ominous warning. In a paper published about a year ago, Ruhl et al. conclude that the end-Triassic mass extinction, about 200 million years ago, started with global warming due to carbon dioxide from volcanoes. This also caused warming of oceans and melting of hydrates at the bottom of the sea, containing methane created by millions of years of decomposing sea life. The hydrates released some 12,000 gigatons of methane, causing global warming to accelerate and resulting in sudden extinction of about half the species on Earth at the time. 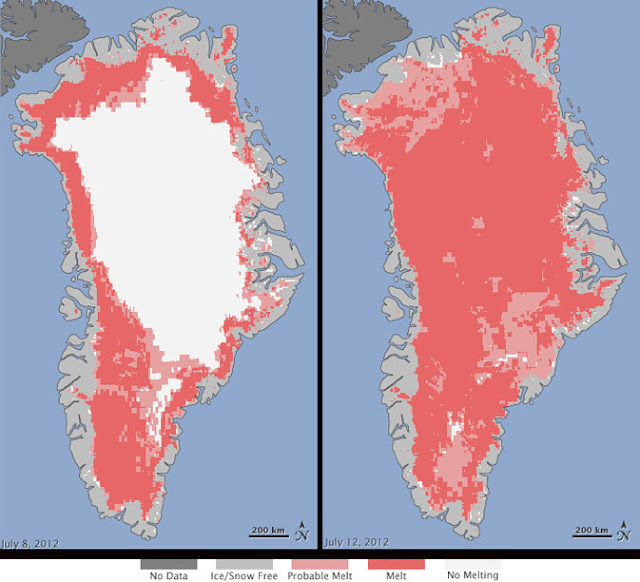 The above image pictures how a similar thing could happen in our times, with global warming leading to accelerated warming in the Arctic, triggering hydrate destabilization and abrupt release of, say, 1 Gt of methane, which would further accelerate Arctic warming and lead to subsequent releases of methane from hydrates. 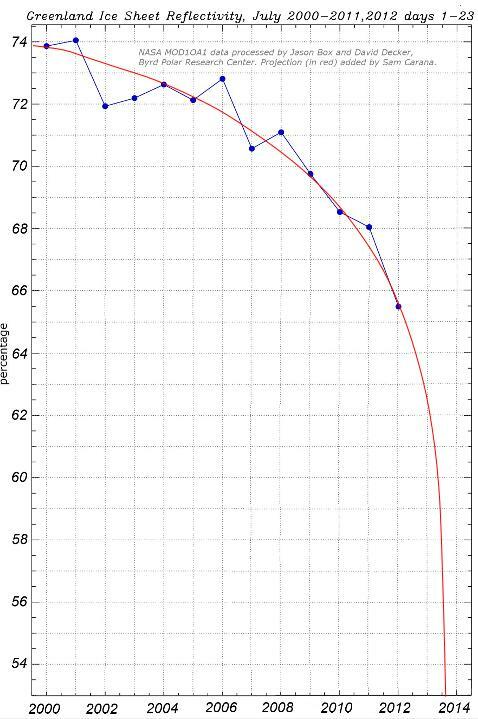 For more details on above two graphs, see the page How much time is there left to act? Could extreme weather, like the U.S. is now experiencing, also occur in the Arctic? Well, it actually did, not too long ago. Above image on the right, from the Cryosphere Today, shows air temperature anomalies in the Arctic of up to 6°C (10.8°F) for the month September 2007. By how much will the sea warm up during such extreme local warming events? 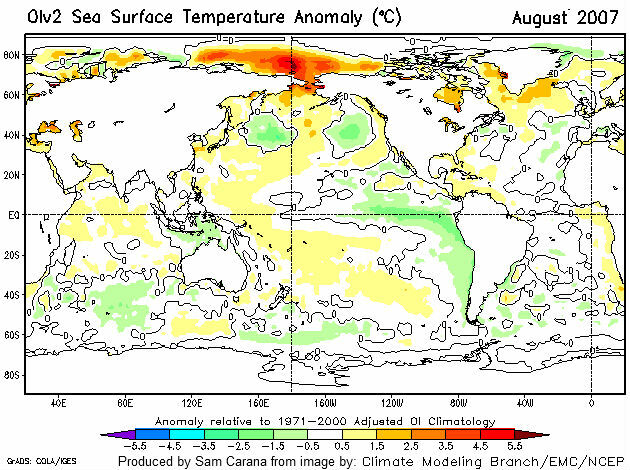 The image below, from NOAA, shows that sea surface temperature anomalies of over 5.5 were recorded for August 2007 in some areas in the Arctic. Could such warming reach the bottom of the sea? Again, this did happen in 2007, when strong polynya activity caused more summertime open water in the Laptev Sea, in turn causing more vertical mixing of the water column during storms in late 2007, according to one study, and bottom water temperatures on the mid-shelf increased by more than 3°C (5.4°F) compared to the long-term mean. Another study finds that drastic sea ice shrinkage causes increase in storm activities and deepening of the wind-wave-mixing layer down to depth ~50 m (164 ft) that enhance methane release from the water column to the atmosphere. Indeed, the danger is that heat will warm up sediments under the sea, containing methane in hydrates and as free gas, causing large amounts of this methane to escape rather abruptly into the atmosphere. Would this heat be able to penetrate sediments? Since waters can be very shallow in the Arctic, much of the methane can rise up through these waters without getting oxidized. 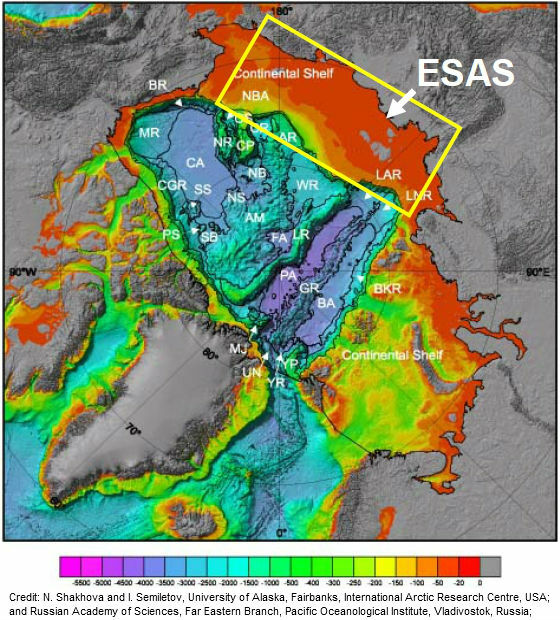 Shakova and Semiletov warn, in a 2010 presentation, that some 75% of the East Siberian Arctic Shelf (ESAS) is shallower than 50 m, as shown on the image below. 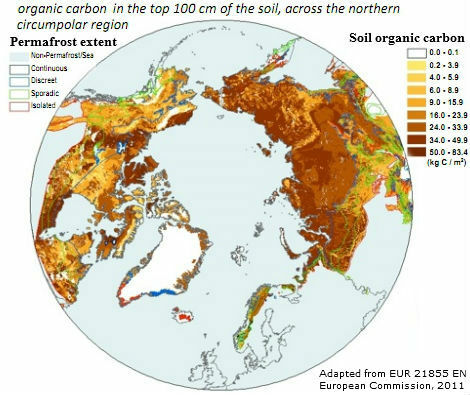 Furthermore, the ESAS region alone has an accumulated methane potential of some 1700 Gt in the form of free gas and hydrates under the sediment, in addition to organic carbon in its permafrost. As the methane causes further warming in the atmosphere, this will contribute to the danger of even further methane escaping, further accelerating local warming, in a vicious cycle that can lead to catastrophic conditions well beyond the Arctic. 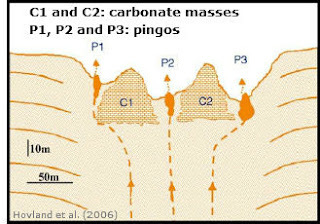 Above image shows the carbon in the melting permafrost, estimated by Schuur et al. at 1700 Gt. Much of this carbon could also be released as methane under warmer and wetter conditions. Under warmer and dry conditions, things wouldn't be much better. 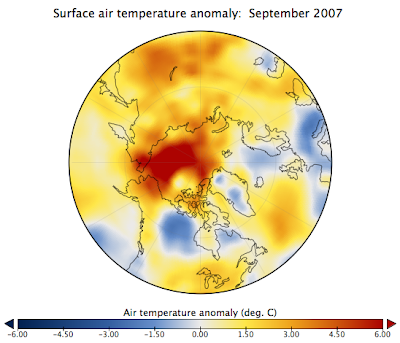 The 2010 heatwave in Russia provides a gloomy preview of what could happen as temperatures rise at high latitudes. Firestorms in the peat-lands, tundras and forests in Siberia could release huge amounts of emissions, including soot, much of which could settle on the ice in the Himalaya Tibetan plateau, melting the glaciers there and causing short-term flooding, followed by rapid decline of the flow of ten of Asia's largest river systems that originate there, with more than a billion people's livelihoods depending on the continued flow of this water. I am writing on behalf of AMEG, the Arctic Methane Emergency Group, in regard to conflicting evidence you have received during your inquiry “Protecting the Arctic”. The inquiry is both a highly commendable reaction to, and a highly authoritative confirmation of, the fact that for the last few decades the Arctic environment is being changed at a rate unprecedented in human history. 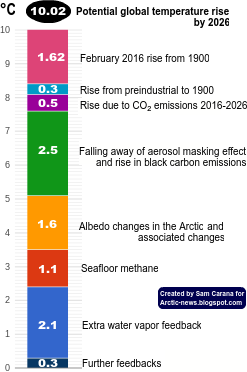 The world’s scientific establishment is unequivocal that these changes to the Arctic environment, particularly the retreating sea ice, were initiated as a consequence of global greenhouse gas emissions arising from human activities. But, as the sea ice retreats, the open water absorbs more sunshine, warming the water and melting more ice in a vicious cycle known as “positive feedback”. Thus global warming from greenhouse gases is amplified in a process known as “Arctic amplification”. There is good evidence to suggest that the Arctic is currently warming several times faster than the average over the whole planet, see Appendix. In the course of the EAC’s ongoing inquiry it has focused on the issue of the retreating sea ice because it is this feature of the changing environment that has attracted the interests of the oil, shipping and fishing industries and is also the critical disruptive element in the Arctic environment. AMEG representatives, Professor Peter Wadhams and I, have pointed out extreme dangers associated with the retreat, warranting the designation of a planetary emergency – a crisis of unprecedented magnitude to threaten all mankind – a matter of national and international security. The EAC invited many organisations to give their evidence on how the near future of the Arctic would play out. 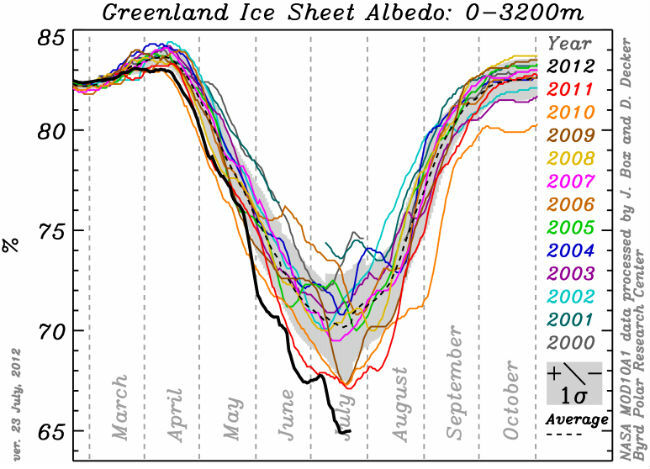 AMEG provided compelling evidence that not only was the rate of reduction of sea ice extent and depth much higher than is currently being predicted by models (such as used by the Hadley Centre) but that the consequential release of entrapped methane, an extremely powerful greenhouse gas, was also accelerating, risking catastrophic exacerbation of global warming in coming decades. 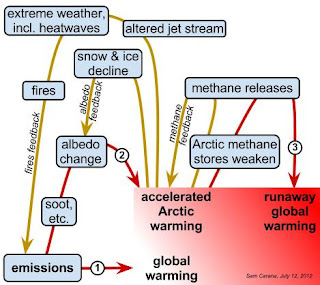 However the chain reaction of Arctic warming and further methane release could be stifled if the Arctic were cooled quickly by measures including geoengineering. In her evidence, Professor Julia Slingo of the Meteorological Office flatly contradicted the AMEG evidence, particularly the evidence of rapid sea ice retreat given by Professor Wadhams. Especially, Professor Slingo said she did not find the PIOMAS volume data credible, and she was expecting to see “better data” fitting the Hadley Centre models soon. 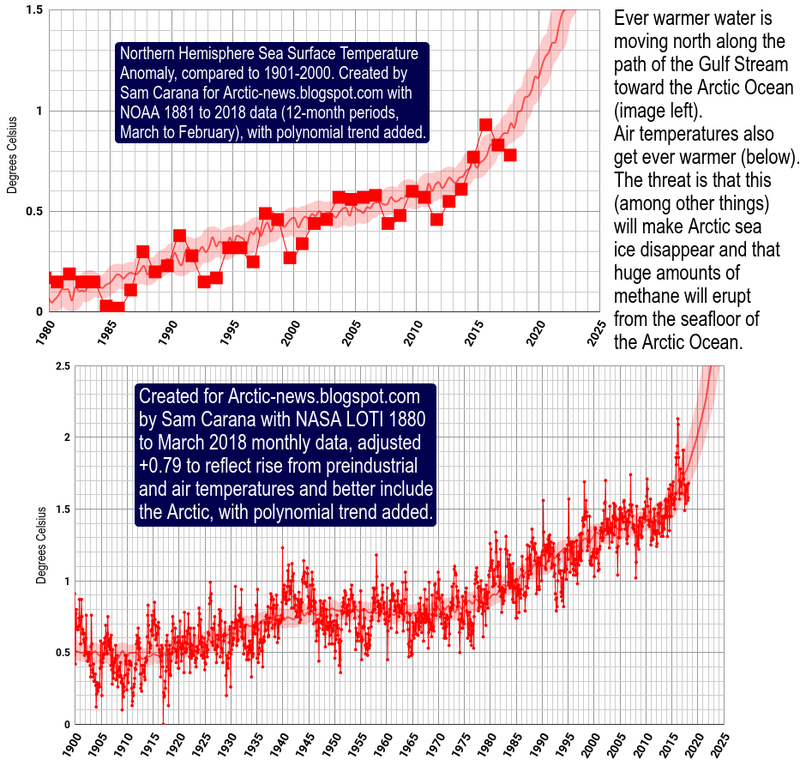 We wish to point out that it is quite extraordinary that Professor Wadhams, an acknowledged expert on sea ice who has spent many years studying sea ice thickness, should have his evidence thus repudiated. However, the committee might bear in mind that the reputation of the Hadley Centre, part of the Met Office, is largely based on their modelling expertise; and their models are still predicting the sea ice demise many decades in the future. Thus Professor Slingo was in effect attempting to defend the Hadley Centre reputation. What the committee may not know is that there was a whole assemblage of models used by the IPCC in 2007 for their AR4 report. Most of these models predicted the sea ice survival beyond the end of the century. 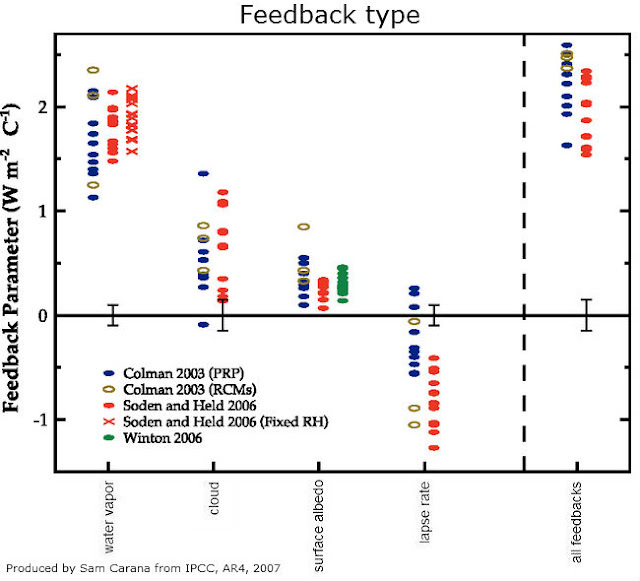 None of the models showed the positive feedback from sea ice retreat that we refer to above. 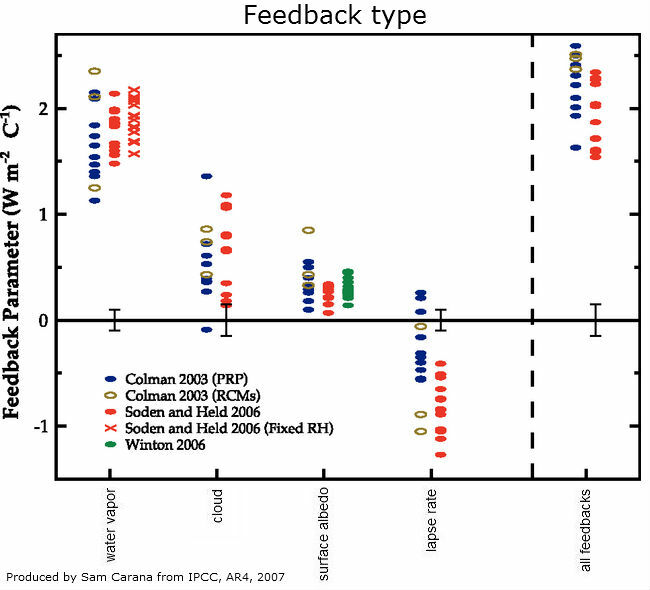 An excuse could be made that this feedback is difficult to quantify and to model, so was omitted on procedural grounds. However the resultant predictions bore no relation to reality. Even in the 1990s, the observations of sea ice extent were deviating from the most pessimistic of the models. Then in September 2007 the sea ice extent plummeted to a record low, about 40% below the level at start of satellite measurement. Nevertheless, IPCC, supported by models from the Hadley Centre, continued on the assumption that global warming predictions could be made for the whole century without taking into account possible sea ice disappearance and massive methane release. 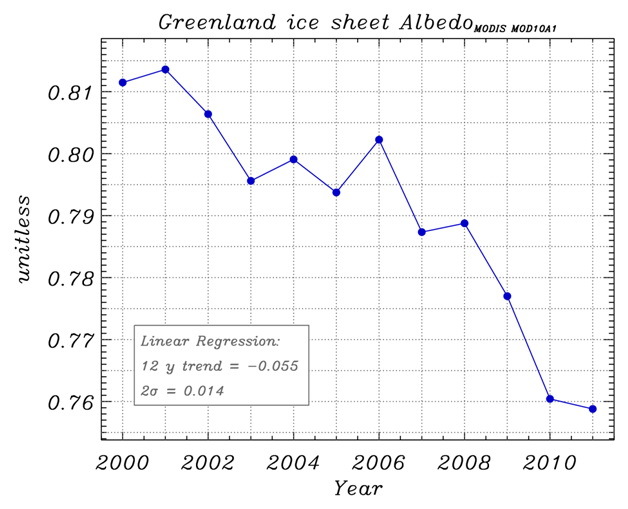 Even with the “wake-up call” of sea ice retreat in 2007, the Hadley Centre would not admit that their models were fundamentally flawed and they continue to ignore the evidence of sea ice volume, which is showing an exponential downward trend. 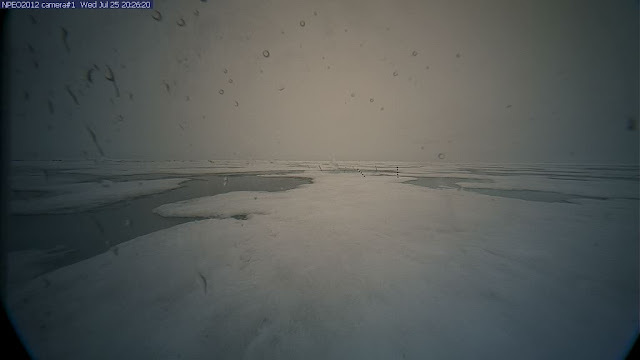 And they are even now ignoring the evidence of the growing methane emissions from the East Siberian Arctic Shelf (ESAS) where “vast plumes of methane bubbles, many over a kilometre across” have been reported arising from the seabed by the Russian scientists, Shakhova and Semiletov. In her oral evidence, Professor Slingo shows apparent ignorance of the Arctic methane situation, which may have misled the committee. She ignores the vast area of ESAS (over 2 million square kilometres) and claims that only a small fraction of methane from hydrates reaches the surface. That may be true for methane from the shelf margins at several hundred meters depth; but the shelf itself is mostly less than 40 metres deep, so the methane has little time to be oxidised and most of it reaches the surface. Furthermore she suggests only a small rise in temperature at the seabed, but in ESAS temperature rises of up to 6 degrees have been recorded. 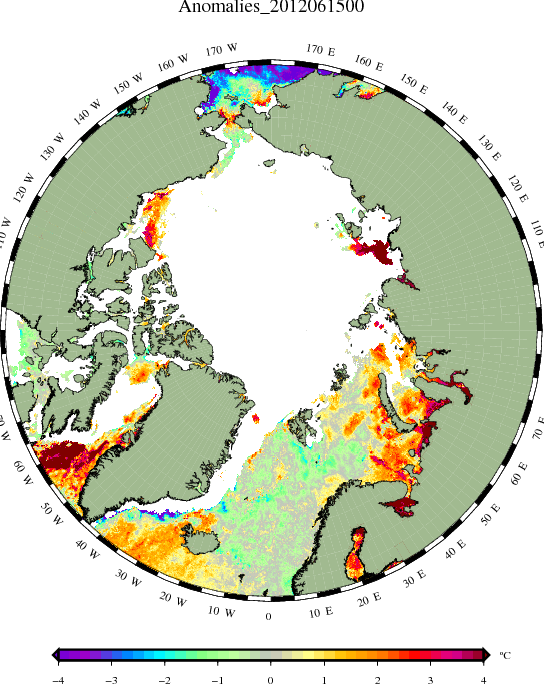 Far from the stratification of the water, which Professor Slingo suggests, there has been a growing turbulence as the sea ice cover is removed, resulting in this seabed warming. 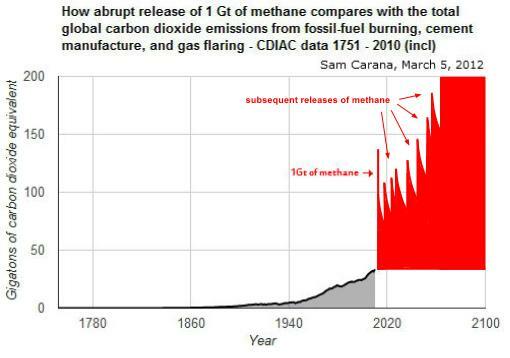 This denial of the true situation might mislead the committee into thinking that there is no significant amount of methane entering the atmosphere, let alone a growth. But methane detection stations show recent spikes in methane levels which can only be easily explained by seabed origin. Furthermore satellite measurements have shown a growing anomaly of excess methane over the Arctic Ocean, again suggesting a seabed origin. All this evidence was available to the Met Office but they chose to ignore it. Thus the Met Office (and Hadley Centre within it) is party to a complete denial of what is actually happening in the Arctic with accelerated warming, precipitous decline in sea ice and ominous rise in methane emissions. We wish to hold the Met Office and its chief scientist to account for putting out scientifically unfounded and incorrect information to delude the government and public that no possible Arctic planetary emergency exists. The importance of the sea ice for the planet is not in dispute; it provides a reflective mirror to reflect solar energy back into space, thus cooling the planet. James Lovelock has made his own estimate that loss of sea ice would be equivalent to the warming of all the CO2 that has accumulated in the atmosphere as a result of mankind’s emissions over the past century. In any event, recent research has confirmed that retreat of sea ice to date is a major cause of Arctic amplification. 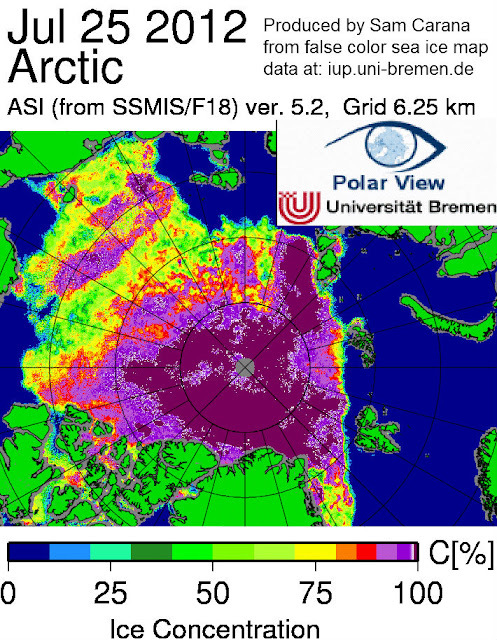 Therefore, if the Arctic Ocean were to become free of sea ice for several months of the year, as possible by 2020 according to the PIOMAS data, there would necessarily be a spurt in Arctic warming. 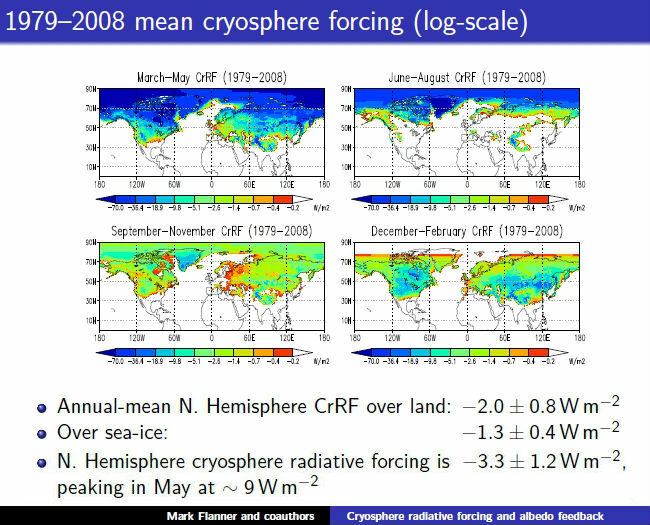 This would be serious in terms of mounting disruption of the Northern Hemisphere climate system (see below). 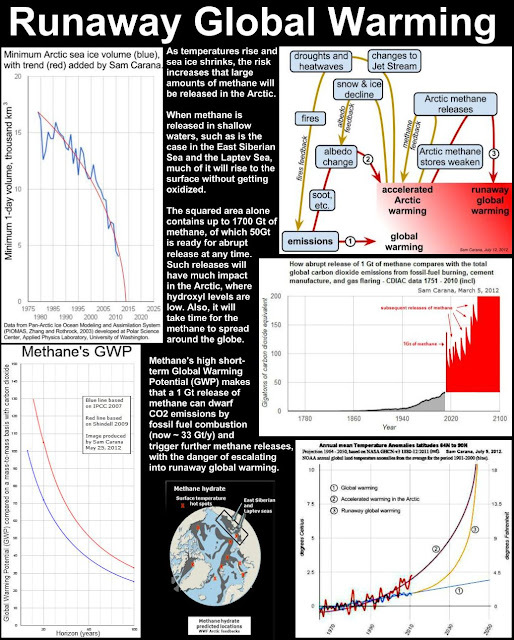 But it would also lead to an inevitable increase in the rate of methane release, risking the onset of an unstoppable methane feedback, whereby the methane causes further Arctic warming and in turn further methane emission in a positive feedback loop. A warning of the danger to all humanity from such methane feedback has been made by top scientists, such as US Energy Secretary and Nobel Laureate, Steven Chu, and NASA climate scientist, Jim Hansen. The likelihood of runaway methane feedback as the sea ice disappears cannot be easily estimated from current evidence, but, even if small, it has to be considered seriously because of the extraordinary devastation were it to get going. 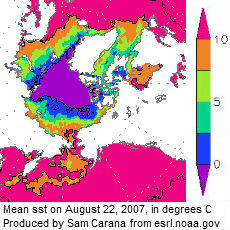 The current disruption of the Northern Hemisphere climate system, with an ever increasing incidence of severe heat waves on the one hand and severe flooding on the other, is likely due to the warming of the Arctic in relation to the tropics, thus reducing the temperature differential that has a stabilising effect on the jet stream and weather system patterns. There is evidence that the jet stream is now getting “stuck” such as to cause the unusual and unpredictable weather which is of considerable concern to farmers. Allowing the Arctic to continue warming is thus a very real danger to food security – which is a strong argument for cooling the Arctic, regardless of other considerations. The evidence given by Professor Tim Lenton suggesting that the global warming produced by Arctic methane would only amount to 0.1 degree or less, by the end of the century, can be dismissed if you accept that the sea ice cover will be removed as quickly as the PIOMAS data suggests. Even climatologist Professor David Archer of the University of Chicago, who recently claimed that AMEG concerns on methane were “much ado about nothing”, admits that a release of only one fifth of the 50 Gt of methane, which researchers Shakhova and Semiletov say could be released “at any time”, would take global warming over the 2°C limit established by IPCC as “dangerous anthropogenic interference” with the climate system. But Professors Slingo and Lenton are not alone in their misleading analysis of the situation. We are appalled that there appears to be no recognition within any part of the scientific establishment, whether Government Departments, Research Councils, Institutes or Universities, of the imminence of extremely dangerous developments that would flow from allowing the present incipient runaway situation to develop in the Arctic. This amounts to a collective denial of danger – a collective burial of heads in the sand. Similarly there appears to be little or no willingness to consider possible actions that could be taken immediately and within the next few years, as necessary in view of the rapidity with which the position in the Arctic is deteriorating. So, what is to be done? Clearly a major effort has to be made immediately to cool the Arctic otherwise the whole of humanity is put at risk. Even if you, as a committee, concluded that the danger is overstated by AMEG, we would argue that the effort is worthwhile as an insurance policy. Suppose that this effort is made and proves to have been unnecessary, what has been lost? The technology for cooling the Arctic will have been developed for use at a later date or for a different circumstance. Contrast the anti-precautionary approach espoused by Professor Slingo, Professor Lenton and the people from the modelling community who submitted evidence against geoengineering just before our hearing. They would prefer to see nothing done immediately to cool the Arctic on the grounds that there is uncertainty in the situation, and it is not yet proven whether (i) the Arctic sea ice is disappearing as rapidly as AMEG warns, and (ii) the methane threat is as great as AMEG warns. This is extraordinary for people who one would expect to espouse a precautionary principle in government, as surely they would in any other situation where there is a risk to millions of lives. Unless these people can prove that there is no risk arising from collapse of sea ice and escalation of methane emissions, which clearly they cannot, the committee has a responsibility to advise government that measures to cool the Arctic need to be taken on a precautionary principle. Note that AMEG considers that the cooling of the Arctic should be seen as one of many efforts to bring the atmosphere and oceans back towards their pre-industrial state, especially since such efforts reduce both immediate and longer-term risks arising from Arctic warming, sea ice retreat and methane release. AMEG is fully supportive of these efforts. Why do these intelligent people from the modelling community seem to view all geoengineering as intrinsically dangerous? That may be the view in the media and among many environmentalists, but these scientists should be capable of a more rational assessment of each technique on its merits, on the limited scale as required for cooling the Arctic. The candidate techniques AMEG proposes are all based on natural phenomena that can be observed. They can be switched off if and when any dangerous side-effects become apparent. There is nothing intrinsically dangerous about geoengineering – mankind has been doing it for millennia by altering the environment, albeit inadvertently. Let’s look on the positive side. Cooling the Arctic and saving the sea ice has the obvious benefit of saving an entire ecosystem. Furthermore common sense suggests that geoengineering will tend to make things better because it is reversing the trends resulting from regional warming. One of the main effects of Arctic warming has been to cause disruption of regional weather patterns in the Northern Hemisphere, with more weather extremes and less long-term predictability of the weather. This has can only have had an adverse effect for farmers who rely on annual cycles like the monsoons. Thus cooling the Arctic should improve this situation. Yet Professor Slingo, in her oral evidence, states that, like the climate forcing from CO2 emissions, geoengineering will have "huge ramifications" implying that it is likely have serious side effects. Of course the very modelling that can be used to anticipate such side effects can also be used to avoid them, by adjusting the parameters of the techniques to be used (see note below). Thus modelling has an important part to play in the successful deployment of geoengineering. Note: Each geoengineering technique has adjustable parameters, to allow the technique to be tailored to a particular situation. In the case of stratospheric aerosols, the height, latitude and time-of-year for the release of aerosol (or aerosol precursor) can be adjusted for maximum positive effect and minimum negative effect, using models to estimate these effects in advance. In the case of techniques to brighten or remove tropospheric clouds, more localised effects can be obtained; and parameters can be adjusted for different locations of deployment giving a great deal of flexibility as well as control. Now we have no option other than to employ our best technology and expertise to get out of the crisis situation we have got ourselves into. We respectfully suggest that modellers should turn their attention to modelling the effects of different geoengineering techniques, showing how unwanted side-effects can be minimised and working out how best to use various techniques in combination. This would be a useful contribution to the enormous challenge now faced to cool the Arctic. They must stop lulling the climate change community, and hence governments, into a false sense of security with their obsolete models which don't take account of reality. In the light of the above we are writing to plead that you immediately alert the Prime Minister and his cabinet to the above conclusions: how the deteriorating situation in the Arctic has extremely threatening implications for all mankind if measures are not immediately adopted to cool the Arctic in order to reverse the current trends of retreating sea ice, escalating methane release and disruption of Northern Hemisphere climate. We realise that, under normal circumstance, we should wait for your report; but this is no ordinary situation. The sooner measures to cool the Arctic can be taken, the better. This is a daunting challenge, perhaps the biggest ever faced by humanity, but it can be met if there is a determined and concerted effort over the coming weeks and months by top scientists, engineers and yes modellers, tasked specifically to deal with the problems in the Arctic. Only a directive from the highest levels of government is capable of initiating the programme of action required. The UN and all world governments must be alerted to the perilous situation now exposed. Traditionally governments have tended to react to events rather than forestall them. But in this case we risk sliding irreversibly into ultimate climate catastrophe. We are close to a point of no return. Not to act as quickly as possible to halt the slide would be an abject failure of the most primary responsibilities of government. And, because such a catastrophe would threaten the life of every person on the planet, not to act would also be suicidal. We implore the committee to give its full and serious attention to the challenge that this inquiry has thrown up, a challenge that whilst embracing the Arctic environment in its essence goes far beyond that in its enormously far-reaching implications for the rest of the planet. The committee has a unique opportunity to change the course of history. One of the questions raised at our hearing on 21st February concerned what life would be like in 20 years’ time, i.e. by 2032. We have considered this in respect of different scenarios, depending on methane emissions. We estimate that the Arctic is warming at about 1 degree per decade, around five times faster than the rest of the planet, and this is mainly because of sea ice retreat and more open water to absorb solar energy. In 10 years, i.e. 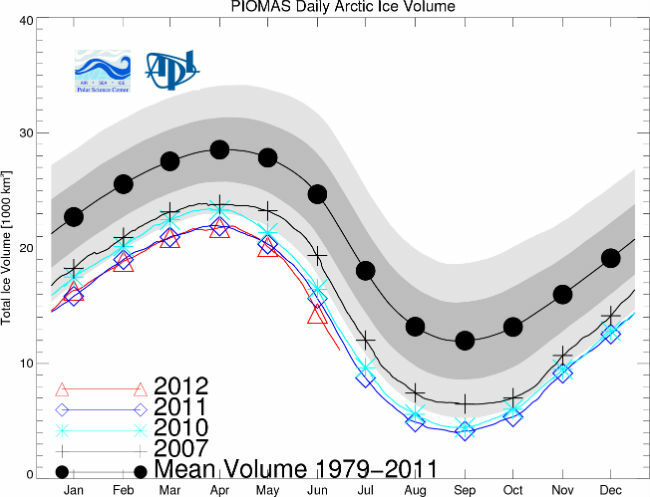 by 2022, PIOMAS volume data suggests that the Arctic Ocean will be essentially free of ice for 6 months of the year, and the Arctic will then be warming at about 4 degrees per decade. The Arctic temperature will be 5 or 6 degrees hotter than today. The disruptive effect on Northern Hemisphere weather systems will be traumatic, leading to severe food shortages for all and starvation for millions if not billions of people. If in addition there were an early release of the 50 Gt of methane that Shakhova and Semiletov say could be released from the East Siberian Arctic Shelf “at any time” (due to seabed warming and the instability of methane-holding structures), then we could expect over 3 degrees of global warming by 2032, liable to start runaway methane feedback. Not only would we be facing world-wide starvation but probably global conflict as well. On the other hand if geoengineering and other measures were successful in cooling the Arctic sufficiently to bring back the sea ice to its pre-2007 volume and extent, then growth of methane emissions into the atmosphere would almost certainly be curtailed and the dreaded methane feedback avoided. The weather systems in the Northern Hemisphere weather systems would be stabilised, allowing the world farming community to plan for providing a growing world population with food. The spread of insect-born disease would be slowed. Conflicts arising from degraded environments would be reduced. And we would have more time to solve the underlying problems to ultimately remove the requirement to use geoengineering technology. Tolerability of life in 2032 will thus depend on whether governments act quickly in response to today’s rapidly deteriorating situation by taking measures to cool the Arctic. Editor's note: Above is a copy of the 31st submission to the Protecting the Arctic inquiry of the U.K. Environmental Audit Committee. Submissions to date are listed below, with links to videos and submissions highlighted in yellow that are particularly relevant to points brought up by the Arctic Methane Emergency Group (AMEG). The post Fires are raging again across Russia featured the image below, showing how much sea waters in the Arctic were already warming up on June 15, 2012. 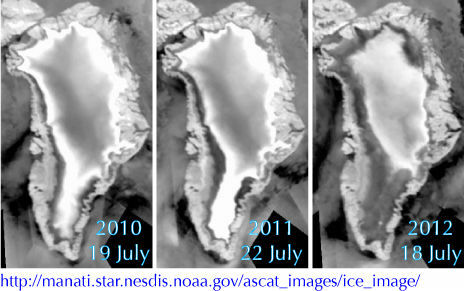 The animated image below shows warming of Arctic waters for the period June 13 up to July 1, 2012.